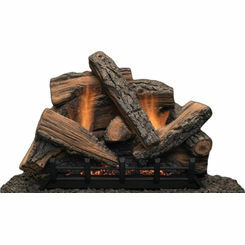 MAJESTIC HO18-R 18" 7PC HIGHLAND OAK REFRACTORY LOGSET FOR NATURAL BLAZE VF 18"
MONESSEN HO24-F 24" 7PC HIGHLAND OAK CERAMIC FIBER LOGSET FOR NATURAL BLAZE VF 24"
MAJESTIC EYF18-R 18" MOUNTAIN OAK 4-PIECE MULTI-LOG SET. FOR USE WITH EYF BURNER. MAJESTIC 18ST-R 18" 10PC SPLIT TIMBER REFRACTORY LOG SET FOR NATURAL BLAZE VF 18"
MAJESTIC HO24-R 24" 7PC HIGHLAND OAK REFRACTORY LOGSET FOR NATURAL BLAZE VF 24"
MAJESTIC HO30-F 30" 7PC HIGHLAND OAK CERAMIC FIBER LOGSET FOR NATURAL BLAZE VF 24"
MAJESTIC HO30-R 30" 7PC HIGHLAND OAK REFRACTORY LOGSET FOR NATURAL BLAZE VF 24"
MAJESTIC EYF30-R 30" MOUNTAIN OAK 5-PIECE MULTI-LOG SET. FOR USE WITH EYF24 BURNER. MAJESTIC EYF24-R 24" MOUNTAIN OAK 5-PIECE MULTI-LOG SET. FOR USE WITH EYF BURNER. 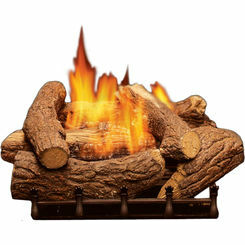 Take advantage of great prices on these gas log sets and update your Fireplace and hearth design with new logs. Make sure the gas logs are compatible with your system. Gas fireplace installations require artificial logs, so buy now. 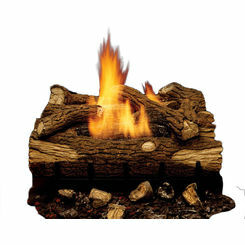 At PlumbersStock, you can buy both liquid propane and natural gas fireplace log sets. 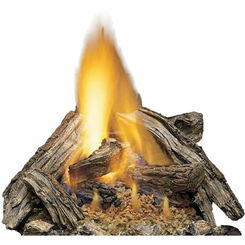 In order to use these logs, it is required to have an existing wood burning fireplace with a decent chimney system. 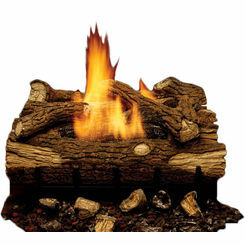 Gas Logs are available in two basic types: Vented or Unvented (often referred to as “Vent Free” gas logs). Save on artificial gas log sets by Majestic.  As with any gas system, always refer to the installation manual and local building codes. 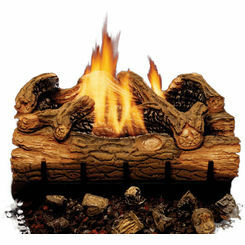 PlumbersStock offers natural gas log sets in a range of sizes to suit particular requirements. 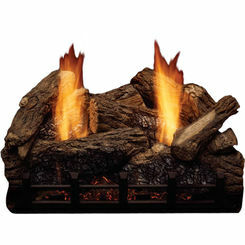 Gas logs come in two main varieties, which include ceramic and refractory. Both are compatible with the same burner applications and offer the same output. Refractory gas logs are advantageous because they are an affordable option. Ceramic gas logs are ideal for those who want to see the logs glow for a more realistic effect. 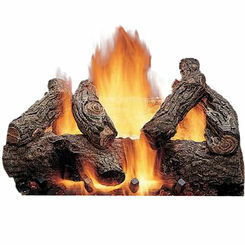 Ceramic logs are also more efficient so for many consumers, they are worth the extra money. If you are only looking for gas logs for the look and occasional use, then refractory logs are the way to go. 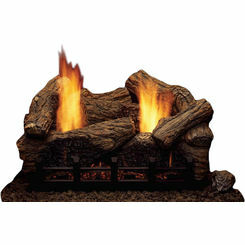 If you want something more realistic that will be used more often, then ceramic logs are your best choice. Different arrangements of log stacks are also available on PlumbersStock, such as Massive Oak, Split Pine, Weathered Pine, and Split River Oak.